During our recent trip to Vietnam, we had fish sauce wings or cánh gà chiên nước mắm at roadside eateries in Vietnam and love the sticky, shellac like layer of fish sauce studded with garlic on a crispy fried chicken wing. 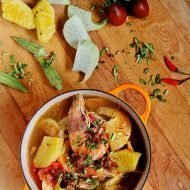 It’s the perfect balanced combination of sweet and salty that Vietnamese foods are known for, and in essence, a process of caramelization not unlike gà kho or thit kho that results in a perfect finger licking lacquer of fish sauce, sugar, and garlic. Here in the US, it’s unfortunate not that many Vietnamese restaurants serve it or else Vietnamese fried chicken wings might be just as popular as Korean fried chicken wings. 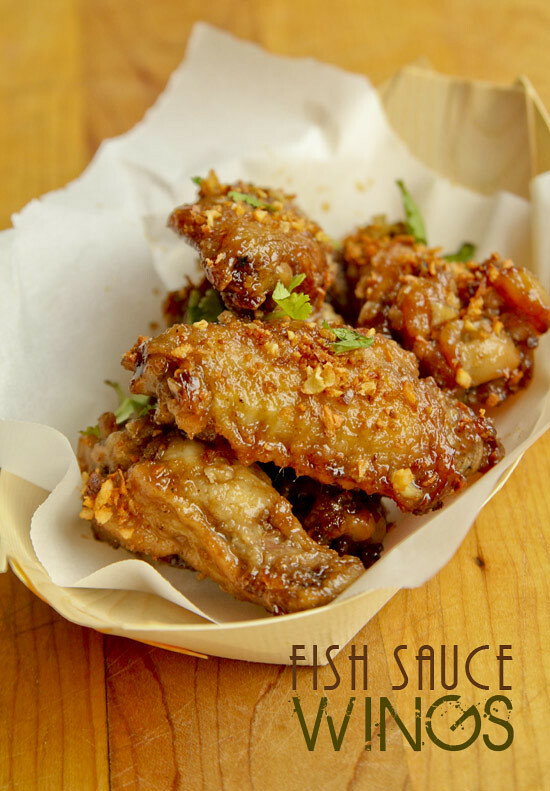 However, chef Andy Ricker and cook Ich Truong of Pok Pok in Portland, have single handedly made fish sauce wings into a huge cult hit. Using Ich’s family recipe, the dish was name Food and Wine’s top 10 restaurant dishes of 2007. We recently made it for the superbowl without changing much, except for increasing the amount of garlic—by a lot. 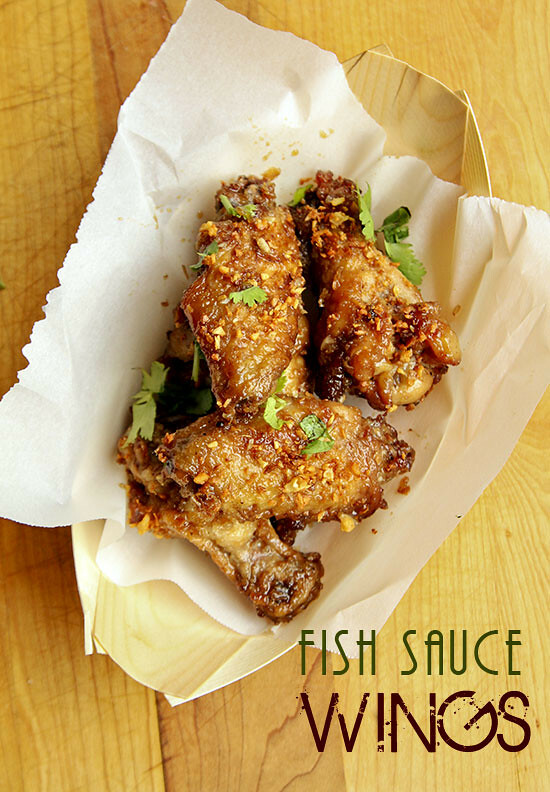 Make sure you use high quality fish sauce for this recipe, such as Red Boat which does not have any additives. The fish sauce and sugar marinade can really handle a lot more than the recipe calls for so we recommend being aggressive on the garlic. 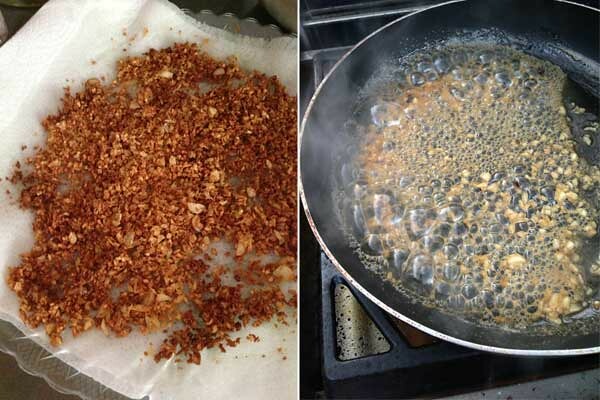 Plus, you can always save any extra fried garlic for another dish or another batch of wings. I love fish sauce wings. Red Boat sauce is what I use to make mine. Thank you for introducing Red Boat to me. But with trying to eat healthy I grill mine. 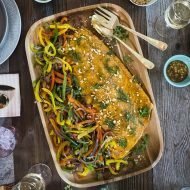 Red Boat put my recipe on their web site. that looks amazing! why i haven’t thought of integrating fish sauce with chicken wings is beyond me. definitely will try this out! i just recently started making pok pok wings and have been surprised at how simple and amazingly good it is. i look forward to trying your version! Love it! 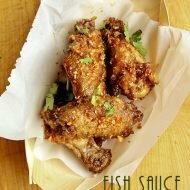 Fish sauce wings are one of my favorite fun things to eat. I recently made a post the wings, but your picture looks much better. Good job guys! I will definitely give this a try this weekend!! My previous experience with a difference recipe didn’t turn out so well, so hopefully this will work better. Quick question – how far in advance do you think these can be made and still taste good (even with the reheat method mentioned above)??? There is also a pok pok in NYC. I thought it was the same thing but that restaurant is Thai i think. Still this looks fantastic though. Thanks for this recipe! All I added was one small birds eye chili and its absolutely perfect. That looks so good! It is exactly the type food recipes I just cannot resist! I dipped the chicken in boiling water for a few minutes, which got rid of some gunk and tightened up the skin. I also added mashed up red chillies to the fish sauce mix. After frying them, I dipped them in the fish sauce mix right away, so the fish sauce infused into the wings and the sugar caramelized on the crunchy coating. I did not marinate the chicken before hand (but I did salt and pepper before cornstarching them in a bag), so I’ll have to compare that later! troi oi that looks so gooood. you could also add chilies to your garlic saute. there is a place near the Vietnamese hub Eden Center in Falls Church, VA and they make a dish that is pretty similar to this called canh ga chien bo (wings fried in butter). my family fights over the garlic and chili topping i completely agree with being aggressive with the garlic! Thank you so much for posting this recipe. I am also from Portland and have always wondered what the trick was to getting the wings so sticky! I can’t wait to try this out! Thank you thank you!! Did you use 4 whole bulbs of garlic? Or 4 little segments? did i do something wrong or are these wings supposed to be super sweet? I made these wings for my family this past Memorial Day weekend and it was a hit!!! I made some adjustments though. When making the sauce, I let it cool for like 20 seconds to form a viscous syrup and poured it onto the wings because the first time I made them, it turned out slightly soggy from the hot sauce being poured onto the wings. The second time I made this recipe, I didn’t have anything to bread the wings with but it still turned out uber yummy. 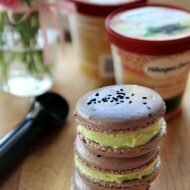 Thanks again for posting this recipe! Also, I tried halving the sauce and is enough for 4 lbs of wings too I found out. Wonderful dish! I didn’t have corn starch so I used sweet rice flour. Do you think the difference would be such that I should get corn starch? (I am making them again…today!) Also I oven fried my wings at 450 flipping half way through and they were great. I think I over cooked the sauce as there was not much left to add to the wings but still sticky. I am so glad to have found you! In the recipe it says ‘Strain over the wings and toss’, is it really necessarily to use the strainer or is it fine to just pour the whole thing over? I saw an episode of diners drive ins and dives, they mentioned using a mixture of tempura flour and rice flour to coat the wings with before deep frying. So amazing! Thanks for sharing- They were gone in minutes! I tried this recipe with and without a coating. Used a very spare dusting of flour since I didn’t have corn starch. I have to say the coating did make them better. The flour gave a respectable little crunch and grabbed the sticky sauce nicely. As an aside, I used a convection oven instead of deep frying. About 20 minutes on 400 (flipped them halfway during cooking). I was very pleased with the results and glad to cut the frying fat. Making another batch for the wife tonight as the kids and I gobbled them up before she got home. Note to first time fish sauce users (like me). The sauce is a LOT funkier right out of the bottle than it is when cooked. I was a little put off at first, but it worked out just fine. Amazon has a reasonable “add-on” price for the Tiparos brand which I will be trying. B. 1/4 cup of whiskey (or cognac) to the sauce. C. 1 teaspoon of pepper. Love your recipe. Made for guests, they were a big hit! I’ve been experimenting a little and used brown sugar to get a deeper color on the wings, and dusted with rice flour and tempura flour ala Pok Pok. Hi, is it okay to fry them lightly the day before and then fry them thoroughly the day after when the actual party starts? Thanks! I just made them but scaled down entire recipe to just 6 wings for me and a 3-year old. First, everything was perfect. Followed recipe. Had to marinate overnight because our plans changed yesterday. Today, the sauce barely existed… so very little sauce for us but the wings were salty crispy good. I’ll try again and make more sauce next time!